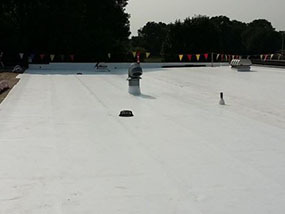 Single-ply roofing has gained popularity in the last 30 years among commercial and industrial building owners in Lancaster, OH. Worldwide, single-ply roofing is famous for its easy installation, durability, and longevity. At E&E Construction, we provide state-of-the-art single-ply roofing installation, repair, inspection, and maintenance. If you are planning to install single-ply roofing on your rooftop, give us a call today at (740) 331-0695. There are many decisions to make when choosing to install single-ply roofing. 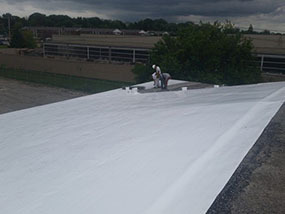 Hiring a commercial roofing contractor who is familiar with all the intricacies of each type of material is paramount. E&E Construction combines high expertise level and top-rated quality products to deliver the finest installation of single-ply roofing. We provide assistance regarding each aspect of installation from start to end of the project. Our partnership with Conklin Roofing Systems gives us access to premier roofing products, backed by more than 40 years of proven performance. Conklin roofing products are the most reliable, high performing, durable, and leak resistant on the market. Just because we are affordable, doesn’t mean you shouldn’t have the highest quality. When E&E works on your flat rooftop, you can be sure that it will reach and even exceed its service life. We hope this information will make choosing E&E Construction for your flat commercial roofing needs an easy choice. You may consult with one of our roofing technicians at (740) 331-0695.